Hope Blooms is a grassroots project, led by youth, enabling the community to take ownership of their food sources and empower people to make a difference in their own lives and the community at large. Children, young adults, and their adult helpers tend a garden in North End Halifax whose harvest helps feed their families and supplies herbs for their successful salad dressing business. Two dollars from the sale of each bottle goes toward a scholarship fund to benefit neighbourhood youth. FBM is very pleased to have been able to contribute to the project's success. Working pro bono, we designed the greenhouse to support the work of Hope Blooms and contribute to the vitality of North End Halifax. We aimed to make the greenhouse beautiful, functional, and durable. The project was made possible by the generous donation of time and expertise by major supporters: Build Right Nova Scotia, Aecon Construction, Lindsay Construction along with many other builders and suppliers. 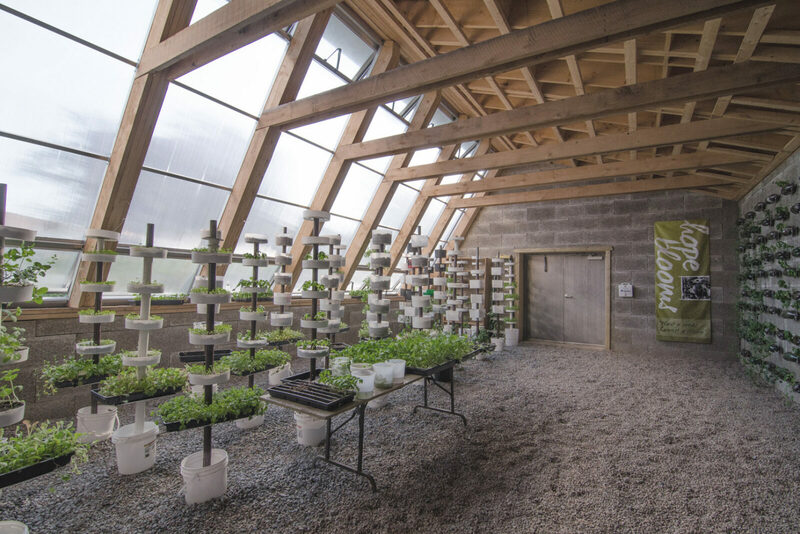 The greenhouse is a 1500 square foot off-grid building. It draws nearly all of its energy from the sun, in contrast with conventional greenhouses (which require fossil-fuel–fired supplemental heating systems)—hence the term ‘solar greenhouse’. Some additional heat will be provided via a compost air-heating system.